Discover India Culture, History, Geography and more. Welcome! If you're interested in exploring India, you're in the right place! We've collected the most in-demand, quality content about this amazing country and included it on this user friendly site for you. We created this portal of information because we've been to this incredible country and we fell in love with its sights, smells, sounds, people and culture! We were married in the city of Ahmedabad, in the state of Gujarat. 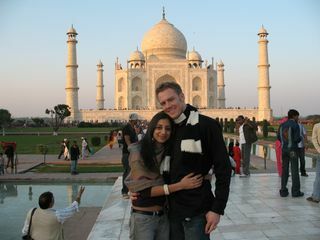 After our wedding, we traveled to many exciting places, like Jantar Mantar, the Lake Palace, Taj Mahal, the City Palace and many more travel destinations! Through it all, we had a great time interacting with family, friends and the kind people we met along the way. We learned a lot about the unique cultural philosophies, the history and the people of this great land and we knew we were somewhere pretty special. The country has a special place in our hearts; this is why we wanted to create a place to share it with you! What would you like to discover? On this site, you can explore the nation's ancient and present culture, or trace landmark events through pages about its ancient, medieval and modern history. You can locate the country on a physical map, learn about its diverse geography, topography and population, or discover travel destinations with travel advice from people who have been there. If you want to learn about Gandhi, the history of Bollywood films, or if you want to learn how to cook some excellent ethnic food in your home, we have you covered. India In Your Home also supplies you with excellent content on the country's art, its popular religions, its economy, government and detailed information on each of its states and union territories. Essentially, you name it and it is probably here. In addition with connecting with India, you can connect with us and our other visitors who share your interest by joining our blog, messaging us, adding Facebook comments to our pages, liking us on Facebook and Plussing us on Google Plus with our on site buttons; we have also added the share feature to our site so you can share what you have discovered with your friends and family. We work very hard to make this site as enjoyable and as interactive as possible and we add new content all the time! To begin exploring, simply click on a link from the main page categories to your left in the green navigation bar; they will take you wherever you want to go, so have a great time! Again, welcome and enjoy connecting with the world's kindest and most colorful country and culture here at India In Your Home.